The 6th Boheme Jazz Festival will take place in Moscow, Russia from May 24-25. Although the festival is only 2 days long, one may not complain about the lack of stars. Herbie Hancock, the greatest living jazz pianist, will perform his "Gershwin's World" program together with State Academic Chamber orchestra. Hancock will backed by Rich Bershew (percussions) and Scott Kolly (bass). This seems to be a quite academic performance, unlike his concert at "House of Music and Dance" club in Zabzre, Poland on May 22 (probably a composition from his "Future 2 Future" record). On May 25th, Cassandra Wilson, the leading contemporary jazz vocalist, will sing "Glamoured", the last record under the "Blue Note" label. "Glamoured" contains songs by Sting, Bob Dylan, Muddy Waters. As Wilson points out herself, such a "cover material" comes naturally from her hometown Jackson, Mississippi. "Down South, musicians have to be able to play in many different circumstances and in many contexts," she says. "They have to play jazz, they have to integrate the blues, and they have to know country. And the lines are kinda blurry sometimes, 'cause that's what everybody wants to hear." Indeed, the very relaxed, but stinging, bossa nova style version of Sting's "Fragile" promises to give a musically varied, idiomatic concert. Further information on the festival and tickets here ! Jazz music was traditionally censored and considered inappropriate in the former Soviet Union. There is even a notorious saying by Lev Tolstoy, that "from saxophone to the Finnish dagger - it's a matter of a single step". But the government pressure didn't stop the musicians from innovating and pushing modern, avant-garde ideas. Alex Kan's "Golden Years of Soviet Jazz" is a very comprehensive and deep, though personal and intimate look at the free and avant-garde jazz movements, artists, clubs and labels in the Soviet Union. Anybody's interested in the time's jazz artistical strivings and struggles, would be recommended to check the article out. What I liked the best, is Alex memories about the release of Con Anima by Ganelin Trio under "Melodie" label. During the time, "Melodie" was the state official music manufacturer, "a bastion of conformity", though the Con Anime made the leading Western avant-garde artists pale. Tallinn, though having JazzKaar, is not the only place grooving in Baltics this spring. Kaunas Jazz Festival (April 20-27) with around 30 various artists and featuring such names as Randy Brecker, Greg Osby and Roy Hargrove, certainly sets a tight but healthy competition in the local festival scene. Obviously, artists like Brecker and Earth, Wind and Fire are on a tour around the region, taking part also in April Jazz in Helsinki, Finland. Brecker, especially, is having jams in every single place, performing with Estonian Dream Big Band in Tallinn, and with Kaunas Big Band in Lithuania. Of course, the new Baltic jazz promo-material - the Sony Jazz Stage winners will be present as well. The most interesting, though, is Greg Osby Four concert. The black saxophonist-flutist has always been a bit of an outsider in the jazz world, often mixing be-bop, rock, hip-hop together in one style. Osby, after graduating Berklee in 1983, joined Ron Carter and Dizzy Gillespieon on various projects, then Jack De Johnette's Special Edition in 1985, staying six years. The year 1990 brought Blue Note contract, and Osby often appeared with Joe Lovano. Osby is known for being obsessed with maths, what also appears in his music - very complex arrangements and improvisations, patterns, a very fragmented style of music. (Looking forward to give you a deeper review of "Banned in New York" pretty soon). In Kaunas, Greg Osby will be with Nicholas Payton (trumpet), Harold O'Neal (flugelhorn), Robert Hurst (bass) and Rodney Green (drums). 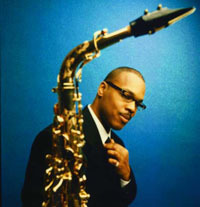 Check check out some of Greg Osby Quartet live tunes at Jazz Standard, NY July 1998 and Groningen, The Netherlands, October 12, 1997. For me living in Estonia and coming from Latvia, Lithuanian jazz scene has always passed by. I guess, the same for many Estonians and Latvians. Here's a bit of the great tradition. If we strictly consider Soviet Union and, therefore, exclude Poland with its Sztanko and Komeda contribution to the world jazz stage, Lithuania would probably be among the jazziest of former U.S.S.R. republics. Lithuanian jazz scene flourished around the end of 1960s, with the forming of Ganelin Trio. The now legendary band came together more by a chance than by a design: soon after coming to Lithuania from Northern Russia, Vladimir Tarasov (drums) joined Vyacheslav Ganelin (piano) in forming a duo. After a gig in Sverdlovsk, a small Siberian city, they met a local amateur saxophonist Vladimir Chekasin. He soon decided to move to Lithuania, and the trio was born. Ganelin Trio made the first international breakthrough of Lithuanian Jazz ever, after storming Warsaw Jazz Jamboree in 1967. Warsaw Jazz was then the most respected and acclaimed of all Eastern European and Russian jazz events. The successful concert resulted in regular invitations from all around the Western jazz world, culminating in 1986, when the trio made an extensive 17-city tour in the USA. Nevertheless, the band split up after Ganelin moved to Israel in 1987. Since then, Tarasov has been in various percussionist projects in Lithuania and the rest of Europe. He is a member of Lithuanian Art Orchestra and Baltic Art Orchestra, as well as an author of several installations both in Europe and the U.S. Meanwhile, Cherkasin formed Lithuanian Academy Big Band and established himself as jazz education authority, with many new leading Lithuanian jazz musicians being his students. After Ganelin, the new Lithuanian jazz players, most notably – Vytas Labutis and Vysniauskas (both sax) – emerged. During the legendary times of Ganelin trio, Lithuanian jazz scene was more tended towards free jazz, an apparent influence from Poland whose Komeda is considered to be the founding man of the movement. (Free Jazz - a stylistic movement characterized by defying the structure of the main theme, style and rhythm of the composition). Now, Lithuanian Jazz moved towards a new stylistic approach by combining jazz and the local folk music elements. Vysniauskas even had a separate collaboration with the vocalist Veronika Povilioniene, often celebrated as the queen of Lithuanian folk singers. Such “folky” inclinations should be seen not only as a result of the first independency breezes, but also as a way Lithuania, a small Eastern European country, pursued its identity in the overwhelmingly Western style of music. Saxophonist Vytas Labutis was the co-founder of many 80s Jazz groups, most notably Vilnius Quartet. Also, worked together with Neda Malunaviciute, a singer and flutist, the rising star among the new generation of performers. Vysniauskis and Labutis represented Lithuania at a festival in Perth, Australia with vocalist Povilione and Dalius Naujokaitis. They also played in Jazz Baltic Ensemble, a regular participant at Salzau festival in Germany. They have also played in Ford Montreux Jazz Festival in Detroit and in New York Anthology Film Archives' sponsored concerts. The most notable of Lithuanian jazz events is Kaunas Jazz Festival. Many world-class performers have visited the place, including, John Scofield, Charles Lloyd, Elvin Jones and Jan Garbarek. See the information on this year's festival later. Vilnius Jazz, not so mainstream and a bit more capricious, is the oldest of country’s regular jazz festivals. It is often stressing the avant-garde, new generation artists. Meanwhile, Klaipeda (a leisure city near the Baltic sea) has been a place for a more entertaining, pop-tended kind of jazz bringing together jazz lovers and tourists every summer. The U.S.S.R. heritage left a handful of very talented and skilled jazz artists, giving a good skip for the new generation - trombonist Vytas Pilibavicius, bassist Eugenijus Kanevicius and trumpeter Valerijus Ramoska. As in the rest of Baltics, the economic pressure has oled to an extinction of long lasting collectives. While it gives freedom and a chance to deepen and enrich the jazz concepts and ideas, it also blocks forming of influential and long lasting jazz schools and approaches. Source: Jahnke, Bernd. Central European Review, “The Baltic Buzz: Jazz in Lithuania – past and present.